We decided not to have a ‘proper’ Christmas tree this year – partly because DD is now mobile and could try to eat it, and partly because it takes up so much room. 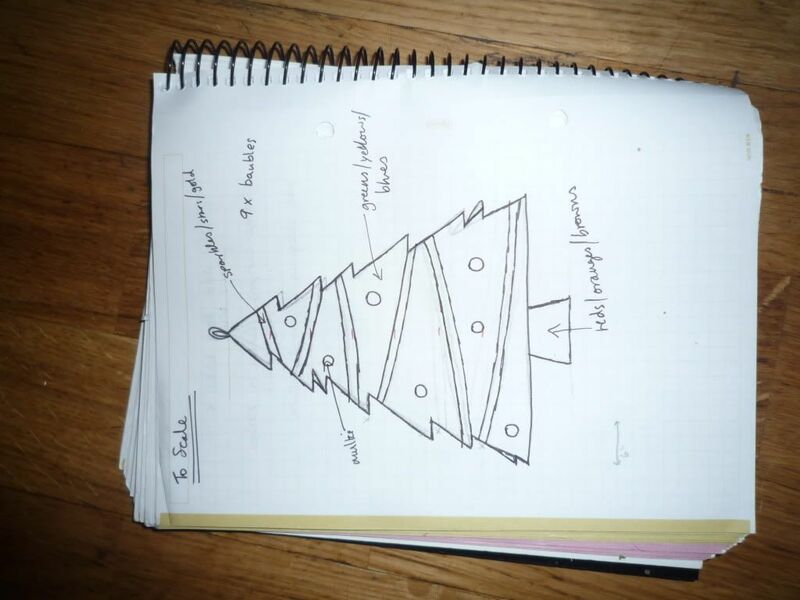 I’d been vaguely trying to think of an idea for an alternative, wall-based Christmas tree-type installation thing to put up in our living room so that it at least looks a bit Christmassy. 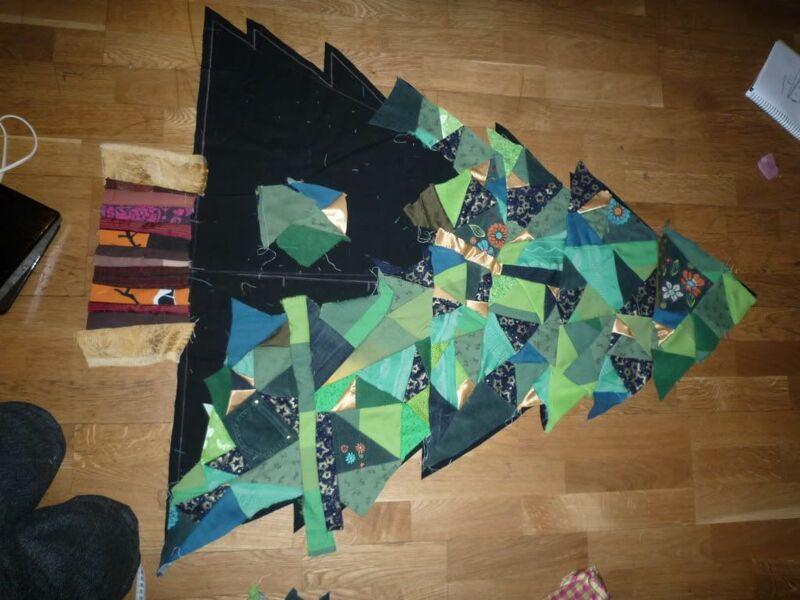 On Monday after DD’s 3am feed I had an idea for a patchwork tree + then couldn’t sleep. 5 days (and not much sleep) later I’ve finished the tree to the extent that it’s main parts are done and it makes the living room look lovely and bright and seasonal. 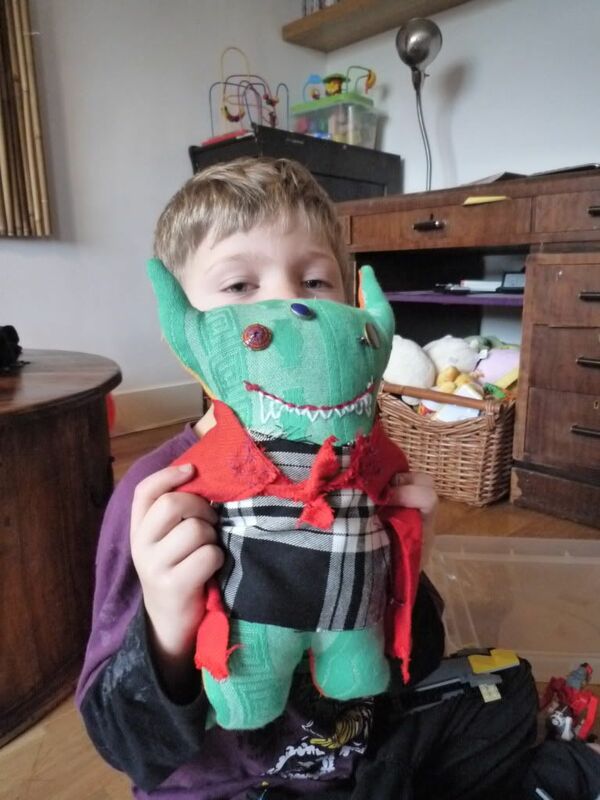 I managed to make it using almost entirely supplies that I had in the house already (I only needed to buy wadding, silver thread and 2 broom handles) – so DH is pleased that the fabric pile is now greatly reduced! I still want to do some finishing touches (like maybe decorations, and a star and adding sparkly beads to the snowflakes), but am super chuffed with it so far. I think that it won’t get properly finished until next year, but at least we all got to enjoy it yesterday! 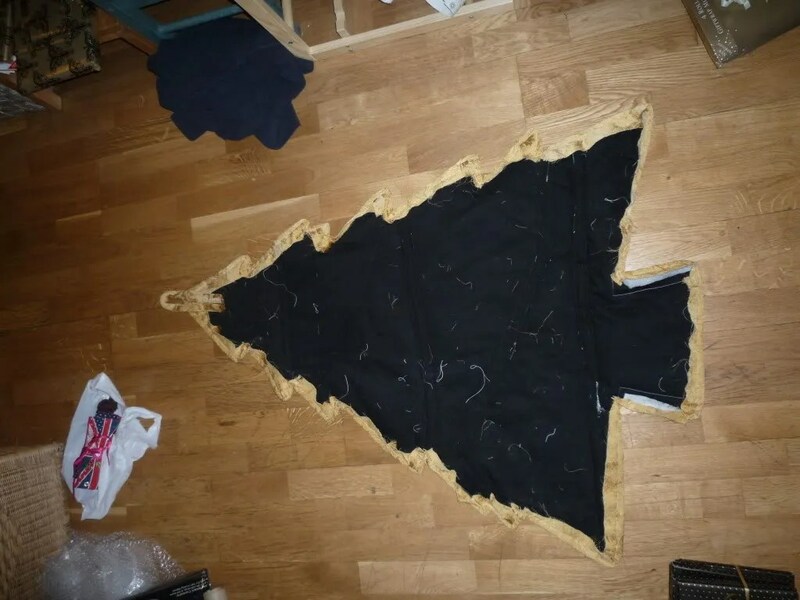 I started by drawing out the design to scale, and then used fabric chalk to draw it out onto my backing fabric (I’m using what I had in the house – a heavy black cotton drill), and roughly cut around it to make a sort of template. 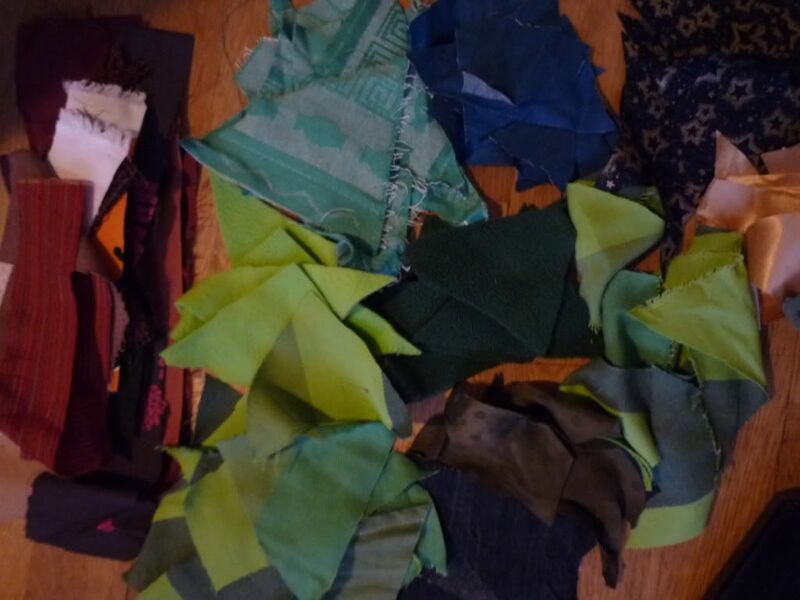 I then dug out all greeny, Christmassy and dark blue fabric scraps that I could use for the tree itself (including old clothes from DS, DD and DH, wrap-scraps, and even some fabric from my grandmother’s old sewing chest – I want it to be a proper family patchwork), and cut them into random 3- and 4-sided pointy shapes of different sizes (sized approx from 4 cm to 20 cm across). 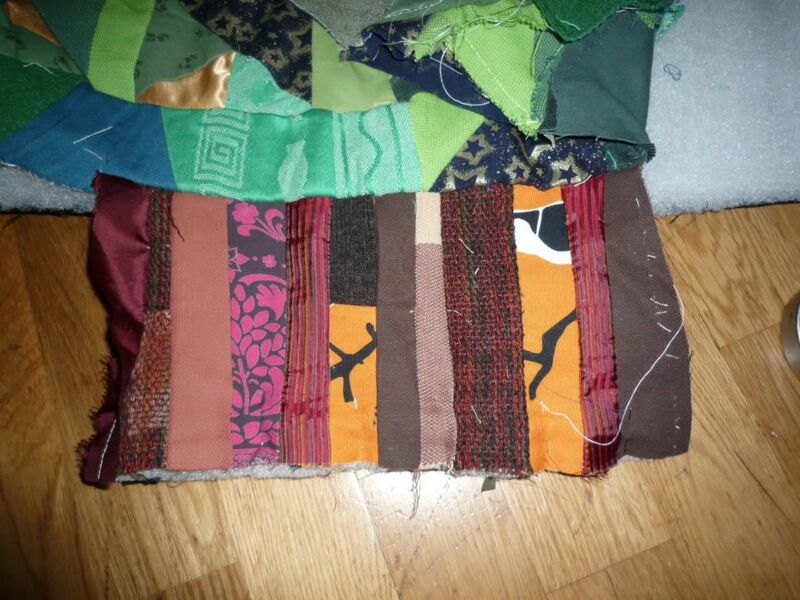 I cut brown/orange/red fabrics into strips (sized approx 20 x 5cm) for the trunk. 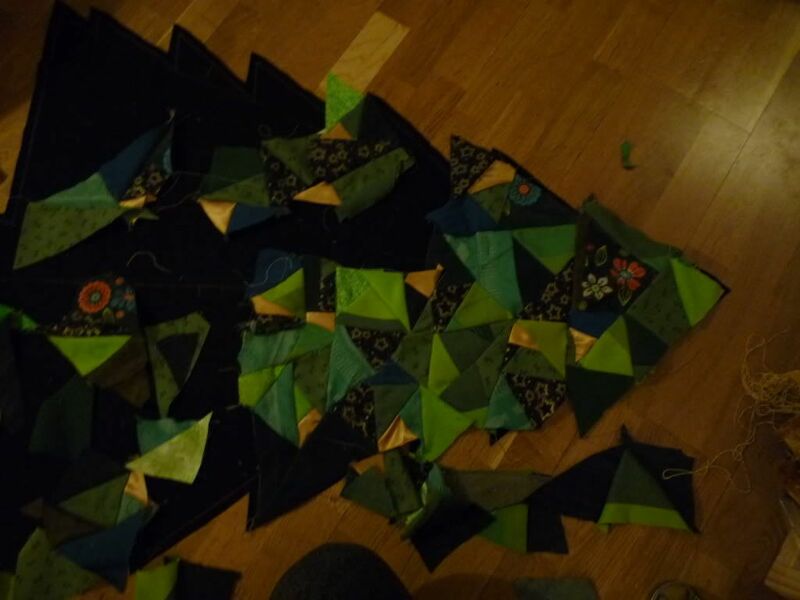 I then started to sew the pieces together into larger 3 – and 4-sided chunks. 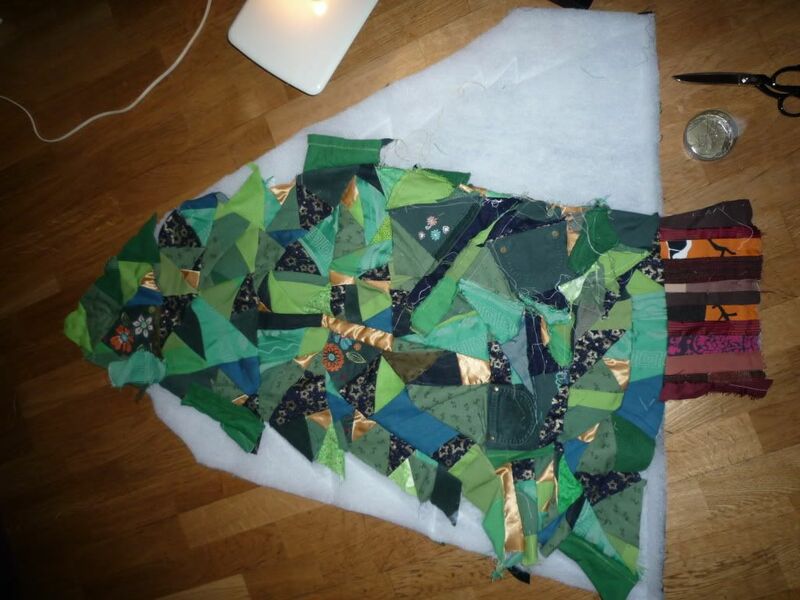 I’m sewing this whole patchwork using a basic sewing machine (it’s an old Bernina 808, if you’re really interested! – simple, but reliable and chugs through anything), with standard size 80 or 90 needles. 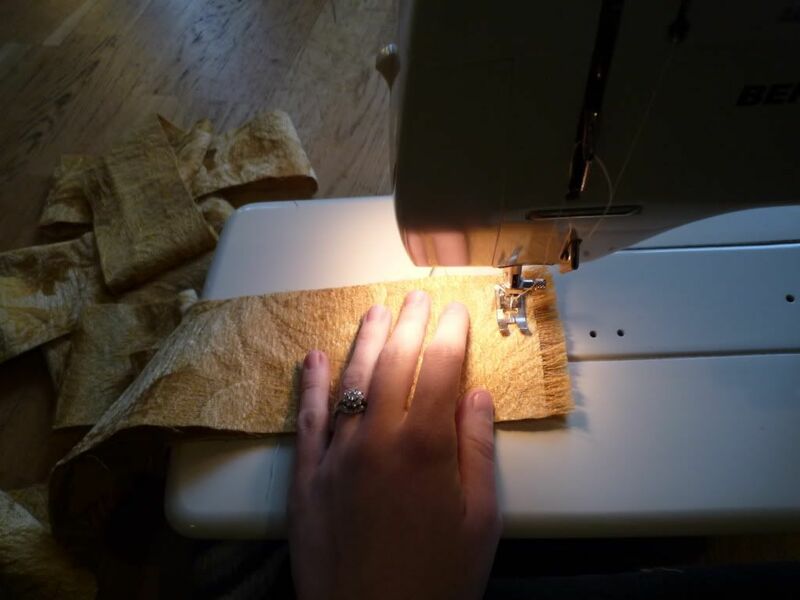 I only used straight stitch, and didn’t bother to go back over the line of stitching to secure the thread ends or anything time-consuming like that. 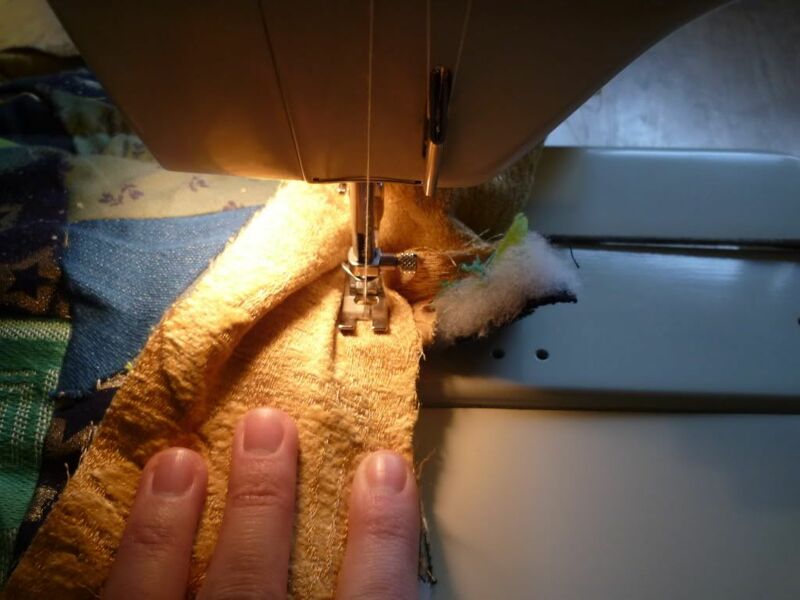 To sew pieces together, I simply placed them face-to-face and edge-to edge, and stitched along about 0.5-1cm from the edge. 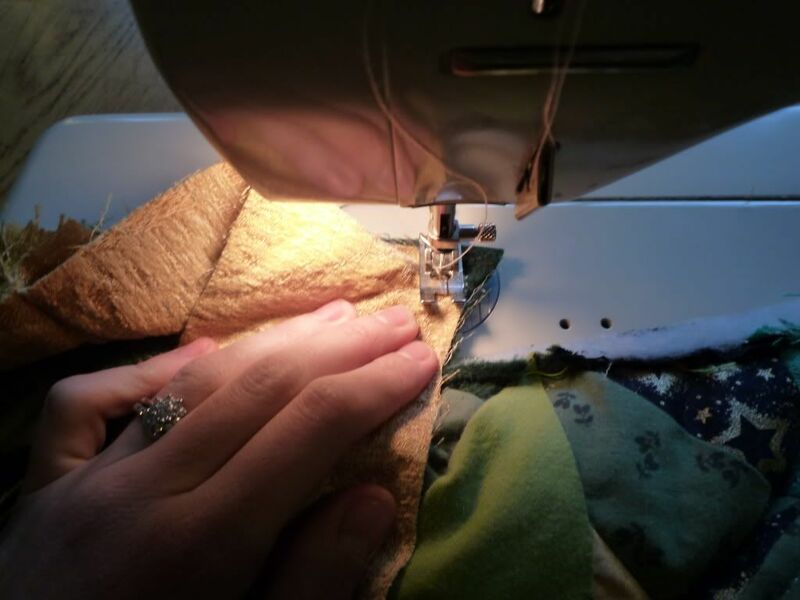 And I know this is almost sacreligeous when sewing, but none of this patchwork has ever seen even a glimpse of an iron (no time! 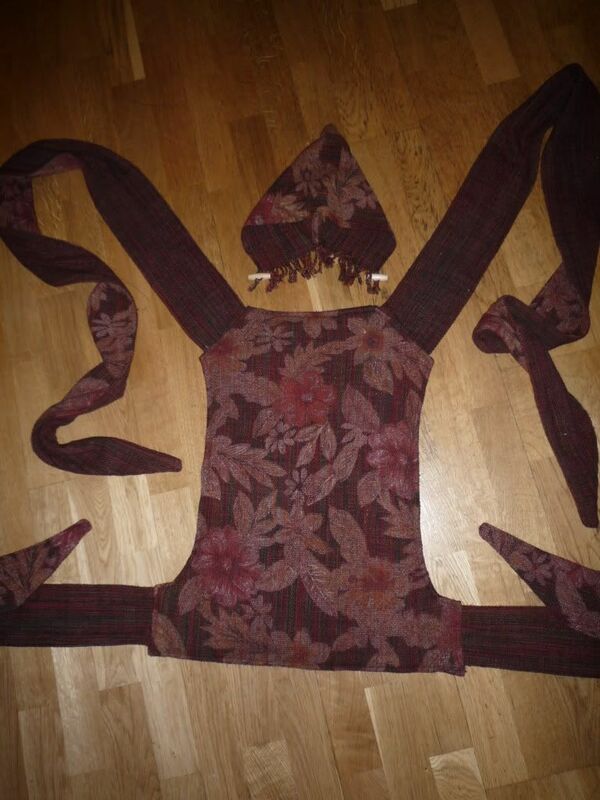 ), so seams were hand ‘pressed’ to lie flat-ish, if at all. 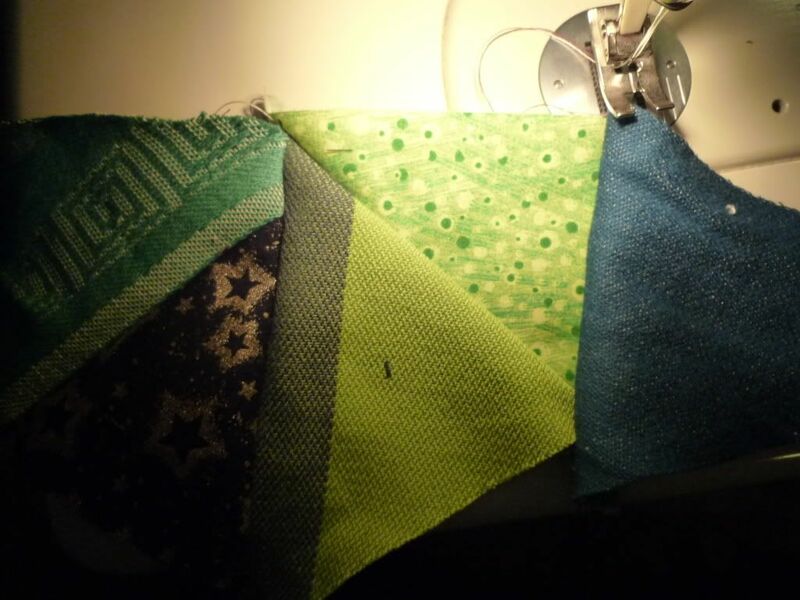 I then started to arrange them onto the backing fabric, beginning at the top point and working down. 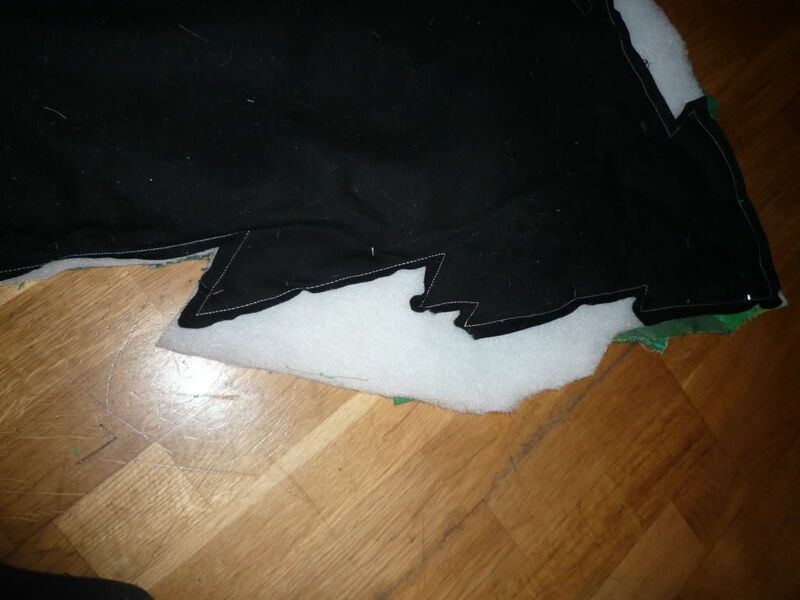 Before adding each bit, I arranged it where I wanted it on the backing (making sure to overlap the edges by about 2cm to allow for seams of approx 1cm). 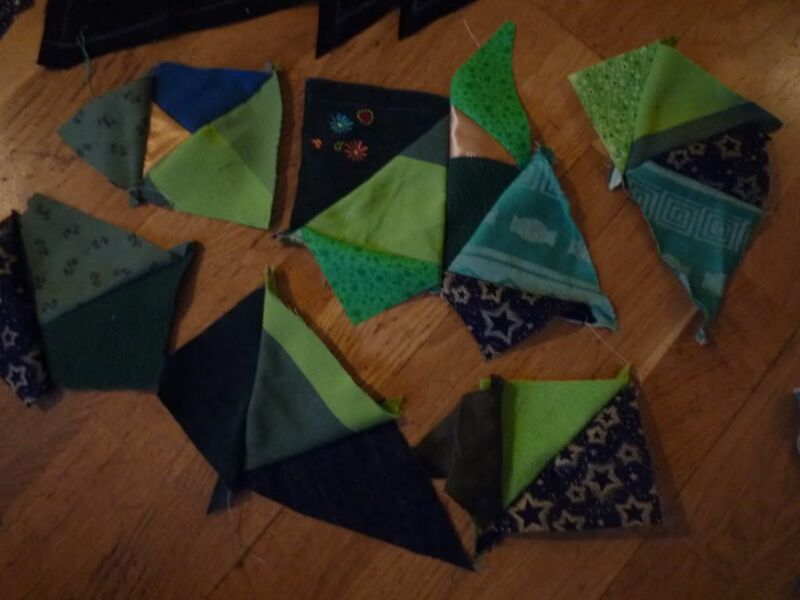 I then took the patchwork bits off the background, put the new patch/chunk and the work-in-progress chunk face-to-face and edge-to-edge (no pins to save time), and sewed them together. I then replaced the whole thing onto the background to arrange the next bit/s. Soetimes I’d have to sew 2 edges of a patch on at once – I did find it useful to pin these at the corners, and also to put marker pins in to show where the edge of a new patch was meant to be on the rest of the tree. 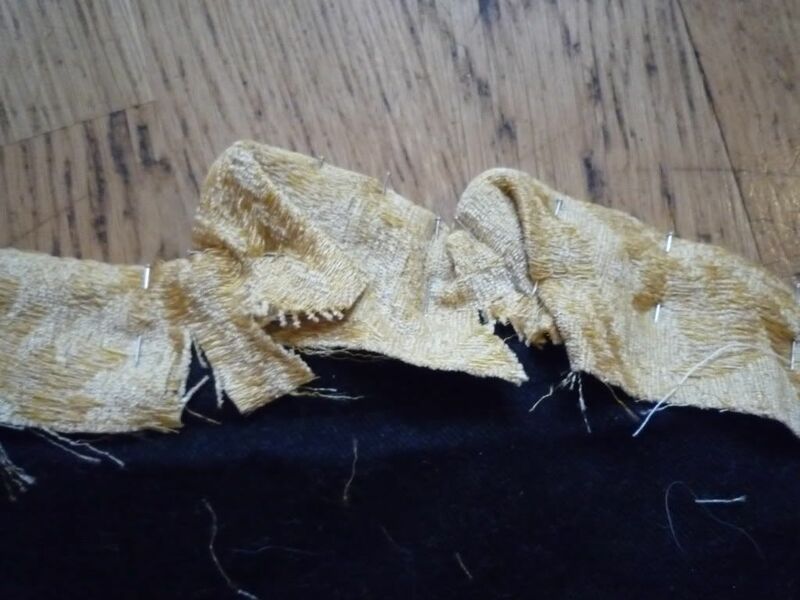 I’m going for home-made uneven chic, so this is all very slapdash and I’m not worrying about lumpy textures, mis-matched corners or not-quite straight stitching – it all adds to the charm! 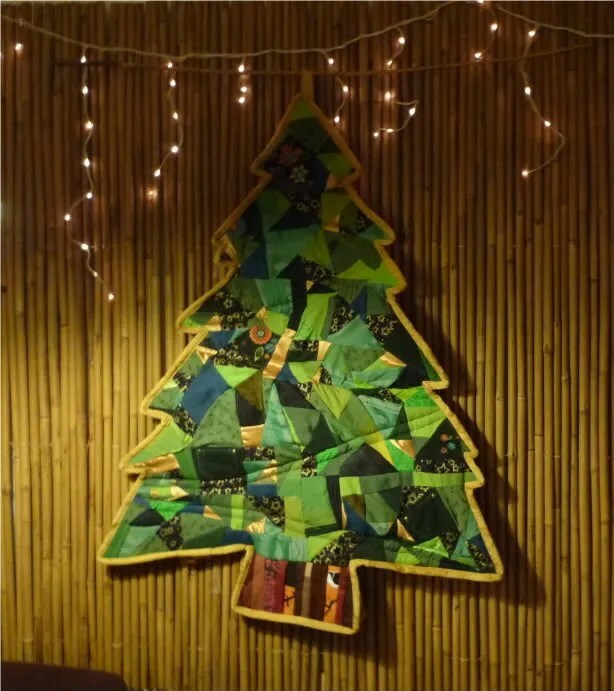 I carried on sewing individual and ‘chunked’ patches onto the tree until I’d covered the whole background tree shape. 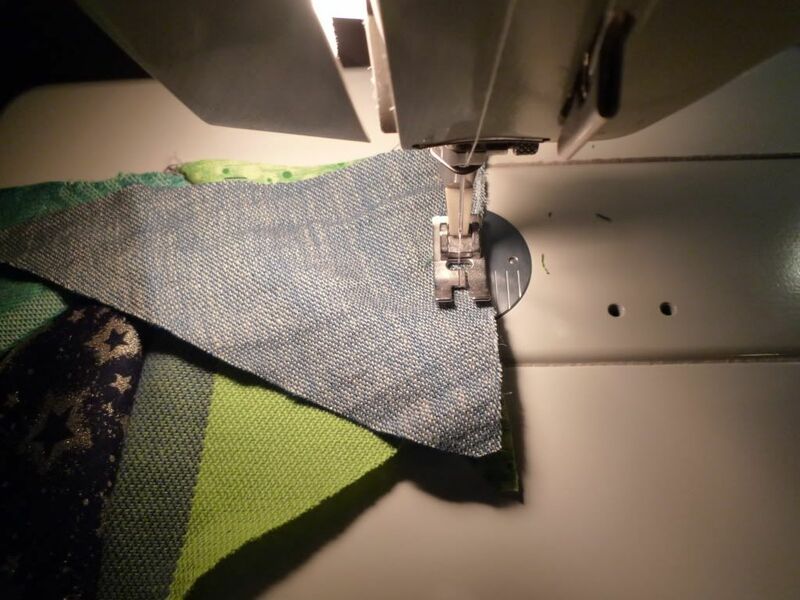 The last bit was hardest as I ended up with a sort of hole in one side (see pic below) and had to fill it by sewing patches into the hole and matching up 3 edges at once, rather than just adding to the bottom add only needing to match 1 or 2 seams (hope this makes sense!). If I did this again, I’d definitely just work down (not down, and up and sideways all at once!) to help keep things simple, and probably neater! 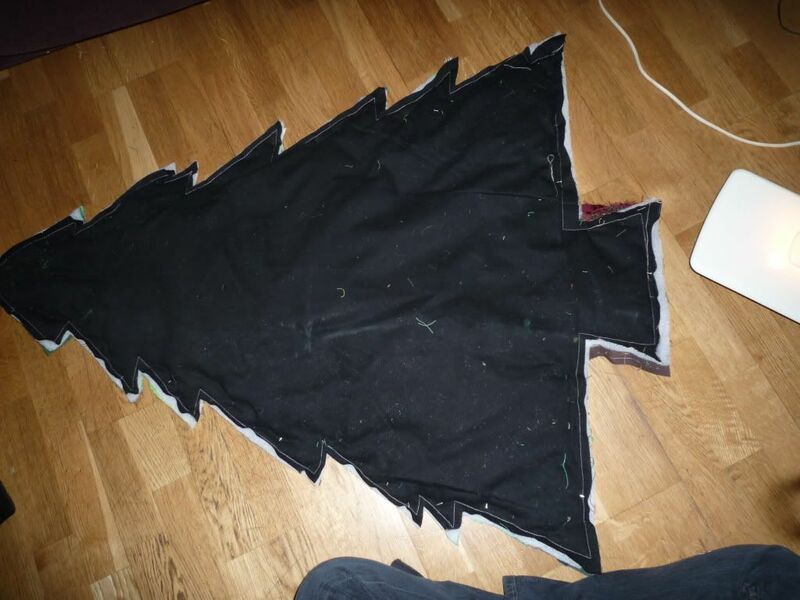 I did the trunk seperately by stitching together the strips I’d cut before sewing the whole trunk to the tree. 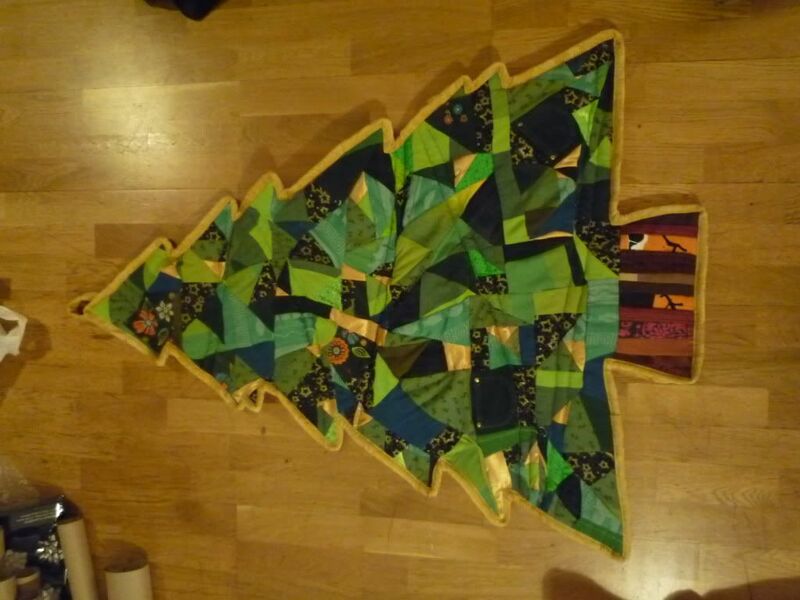 To emphasise again, I didn’t do any of the patchwork very neatly – the tree doesn’t lie completely flat, some patches don’t really match up properly at the corners, and there’s various bits where I should probably finish sewing seams by hand, but the overall effect is what I’m after, so I’m not bothered about the less-than-perfect bits. No-one is going to stand up close to this and analyse it – it’s for looking at from a distance, so I’m not going to get self-conscious and obsessive about it (easier said than done, but luckily no time to dwell on mistakes!). 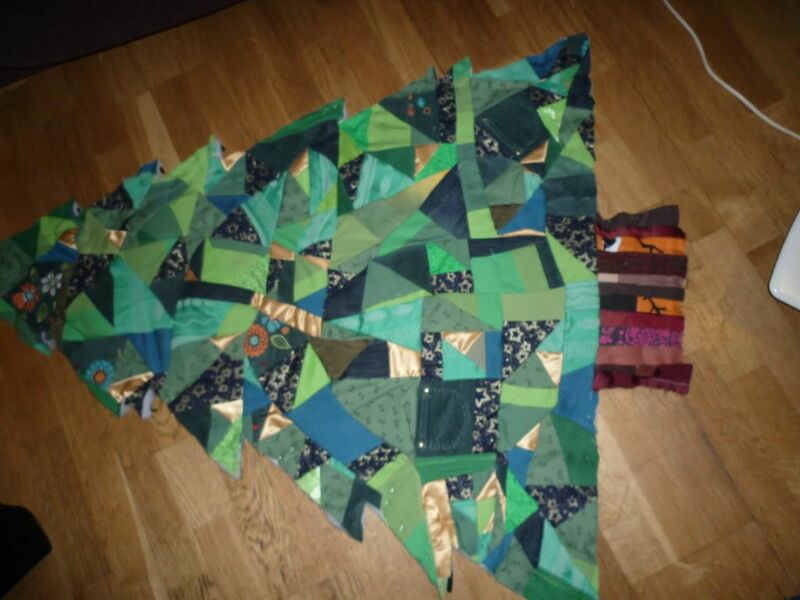 I sewed wadding onto the backing fabric, and then pinned the patchwork onto the background + wadding. 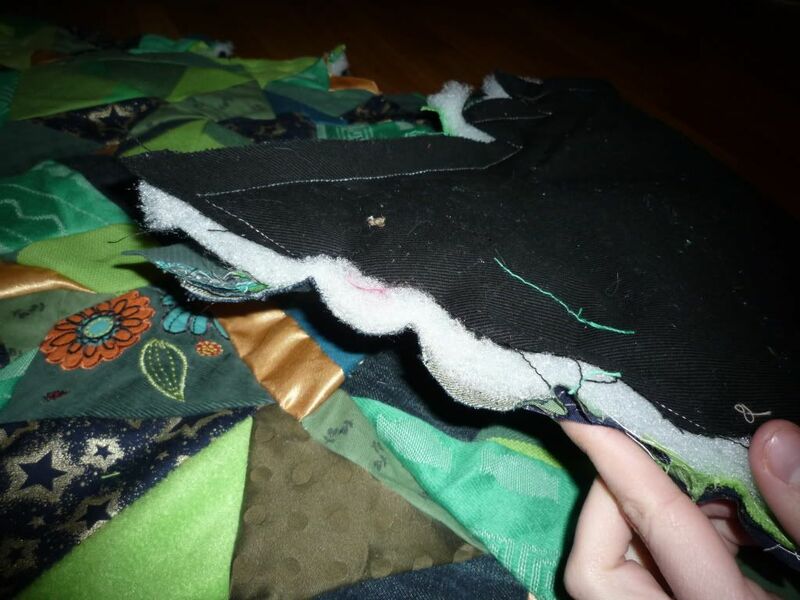 I sewed around the edge through all 3 layers and then trimmed off the excess patchwork and wadding sticking out to about 1cm from the row of stitching. 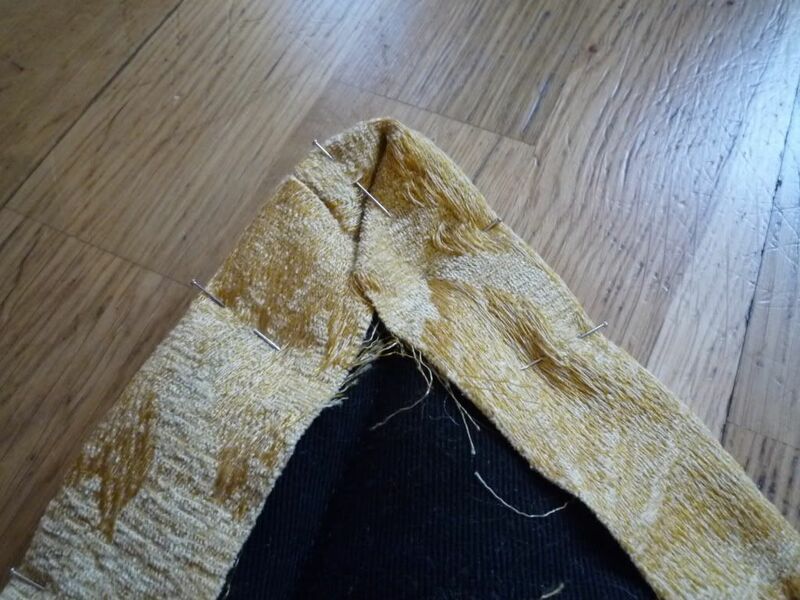 Start to be careful with the sewing as the multiple layers will get quite thick and some fabrics will be harder to sew through just go slowly, and hand-crank the machine rather than force it with the peddle (this will often break the needle) if it’s really hard going. 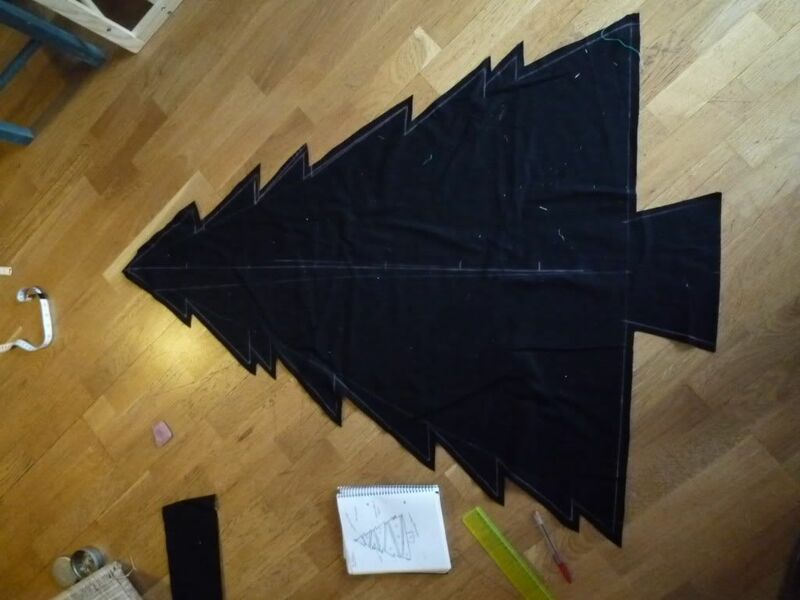 I didn’t have time to do any ‘proper’ quilting on the tree (and I’ve never done quilting before so wouldn’t know what I was doing anyway), so I decided to sew lines of silver thread across the tree to look a bit like tinsel, and to divide the tree into vaguely triangular sections (and hopefully make it look a bit more fir-tree like). I just did this on the machine with straight stitch and silver machine thread. To finish the edge, I decided to use a lovely gold upholstery fabric remnant I’ve had lying about for ages. 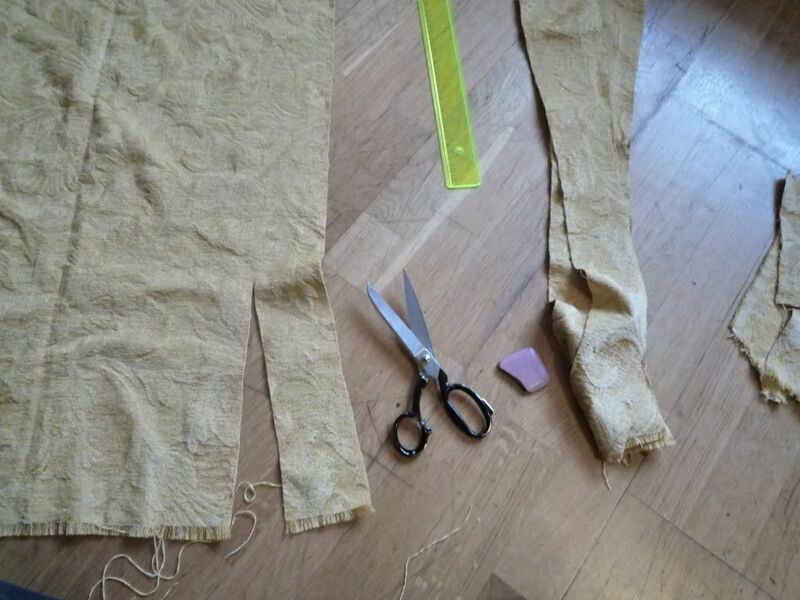 I cut it into 8cm wide strips and sewed the strips together end to end. 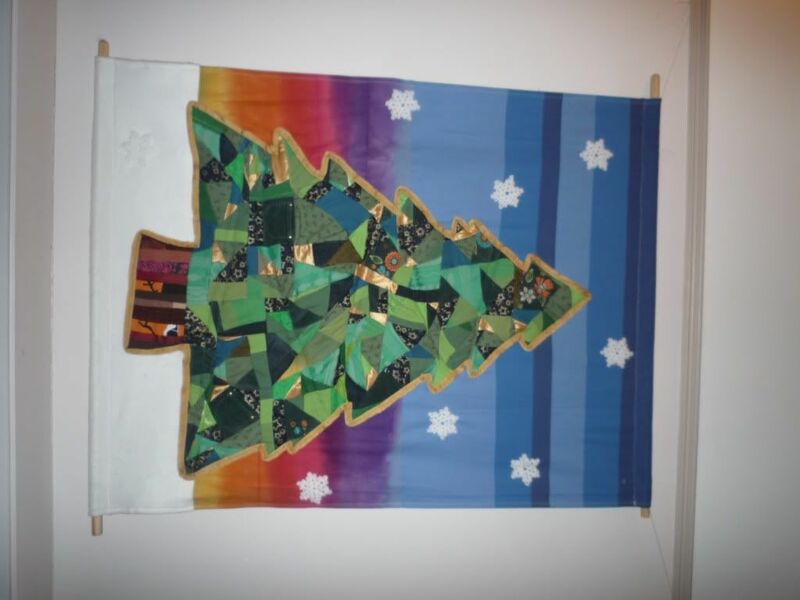 I then used it as a sort of bias binding, sewing it to the edge of the tree (about 1.5-2cm in from the edge). 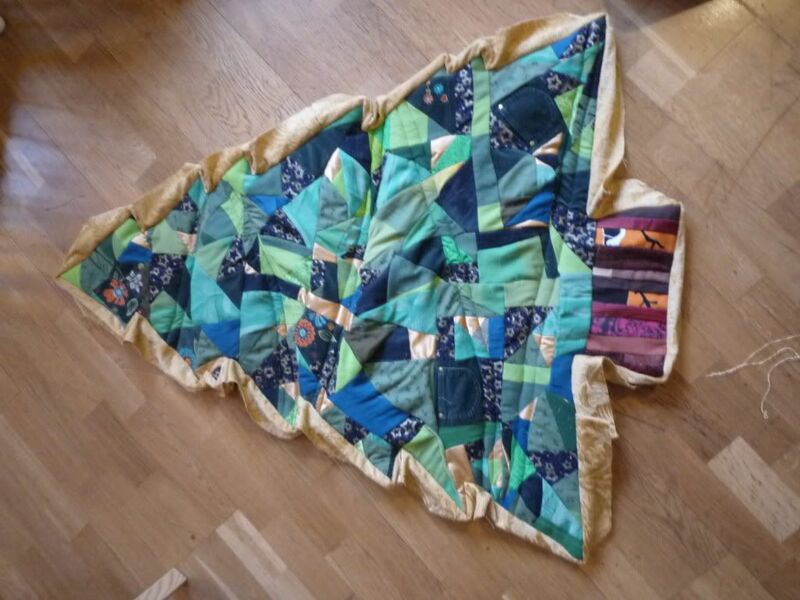 This is easy enough on the strights of the tree, but needs a bit of care around the corners (pics of sewing ‘inside’ and ‘outside’ corners below). Again, all these layers will really start to test the machine, so it’s best to hand-crank it by just turning the wheel, rather than properly ‘machining’. But I still had a day before Christmas Eve, and it wasn’t really hanging properly flat (because of the slapdash approach to patchworking), so I decided to make a background to fix it to. 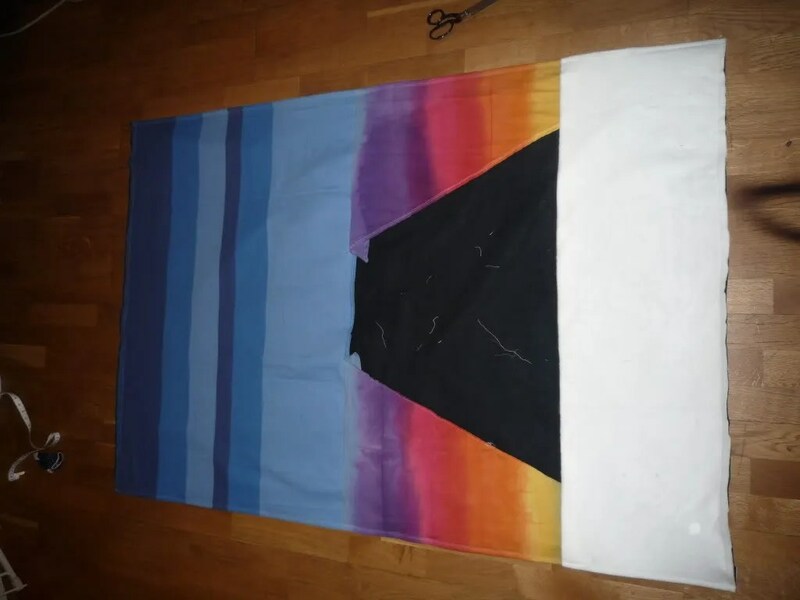 I cut a 4′ by 5′ piece of backing fabric, and sewed a blue striped large scrap of wrap fabric to the top half for the sky, triangular sections of the bit of rainbow-dyed wrap that I cut off my amazonas rainbow (dyed in a previous post) to the middle for a sunset/rise, and some lovely snuggly bamboo fleece at the bottom for snow. The blue piece I simply placed + pinned on the backing and stitched on top all around about 1 cm from the edge. 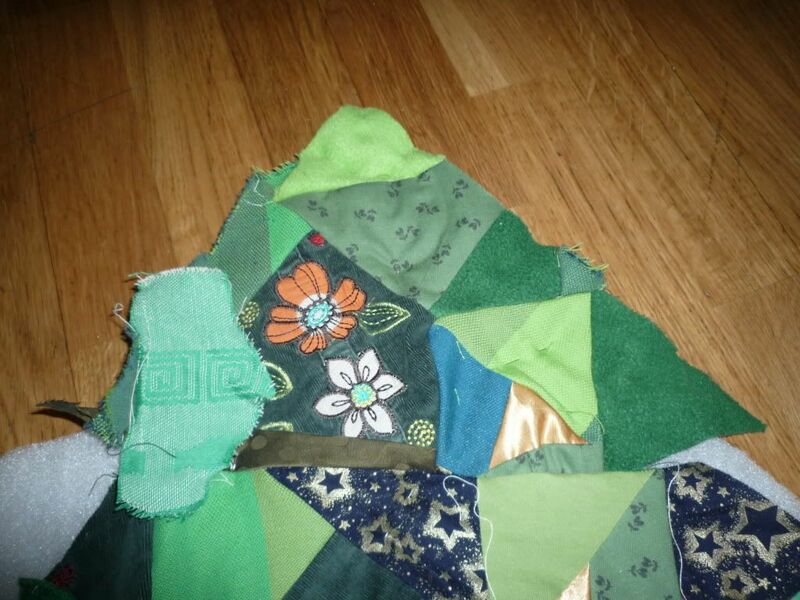 The rainbow pieces, I turned over, pinned and stitched through the blue piece as with adding patchwork pieces above to hide the stitching. I then turned them over and stitched around the sides to secure them flat. I added the white fleece in the same way so that the stitching across the background was hidden. I pinned all of these as they are bigger, and I wanted to make sure they would lie properly flat. I hemmed the sides of the whole thing to hide the raw edges, and then sewed channels at the top and bottom to fit a couple of broom handles in (I did the top/bottom channels exactly the same as the hemmed sides, but folded over more fabric to insert the poles). I’ll hang the whole thing from the top one, and the weight of the bottom one will ensure that it all holds it’s shape when it’s hanging. Family fabrics: tree: olivey green w dark green flowers from Grandma Joan’s sewing chest, light and emerald green T-shirt fabric used in monster/dragon T-shirt for DS, dark green cord w embroidered flowers (+ pockets) from old trousers of DD, dark blue demin cut off a pair of my shorts, light khaki green cotton from a zip-off leg of DS’s old trousers; trunk: 100% raw silk hand-woven stripey/flowery fabric in earthy colours (also made into a Mei Tai – here: http://i149.photobucket.com/albums/s74/embankment/Slings/P1040707.jpg – and 2 scarf wraps for me), brown 100% lambswool from old jumper of DH, orange birds cotton Ikea fabric (also made into a pouch sling for DD and a much-loved handbag for me), heavy brown cotton drill/canvas (also made into wings for sister to be a chicken when we did the Vertical Rush event for Shelter dressed as a chicken and and egg…to see who came first, obviously!…detail here: http://www.justgiving.com/emandvertijo and here: http://www.facebook.com/group.php?gid=51628477011#!/group.php?gid=51628477011&v=photos&so=0 and photos of the finished outfits here: http://www.flickr.com/photos/emilywilliamson/sets/72157615672131086/); background: black cotton drill from fabric stash (bought unexpectedly as a huge remnant about 10 years ago and has become part of many many projects, including as a backing for the egg mentioned above! 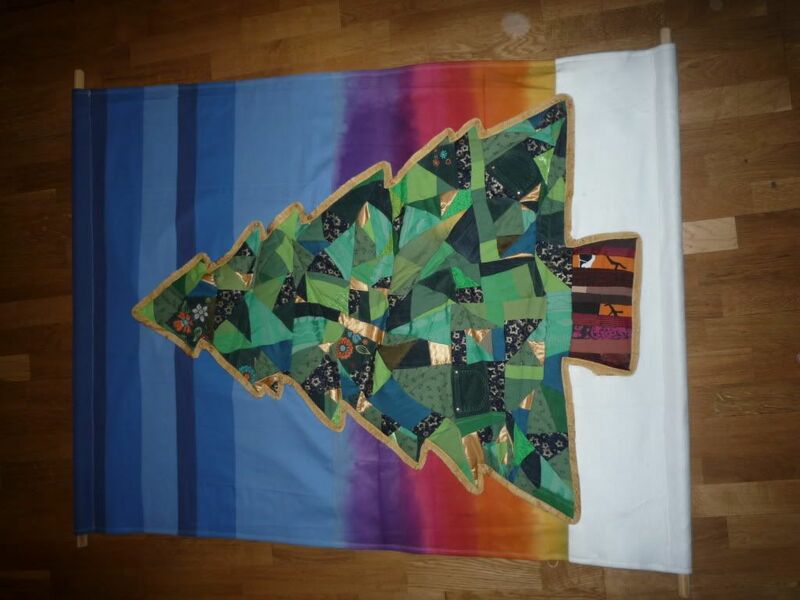 ), much beloved Home-Dyed Amazonas Rainbow (tree patch and background sunrise/set). 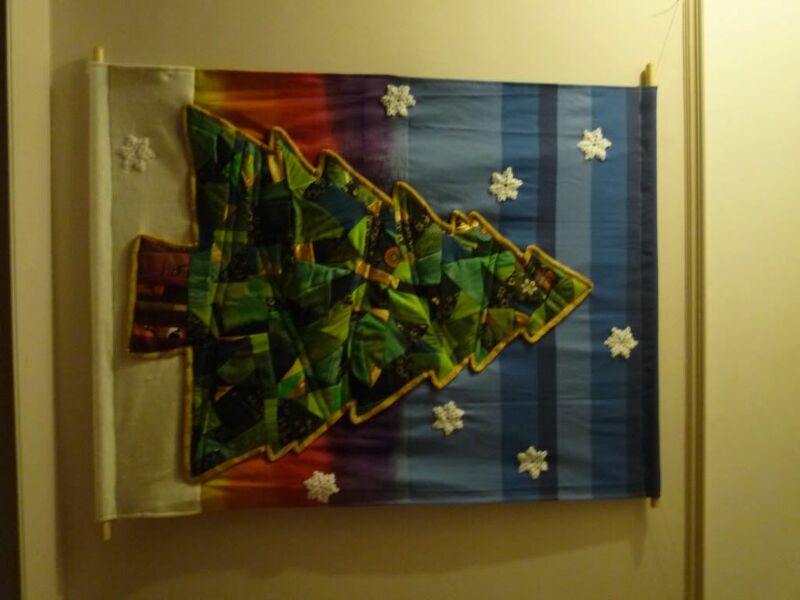 This entry was posted in Crafting, Patchwork and Frankenbooks and tagged christmas, christmas crafts, christmas tree, hanging, patchwork, quilting. Bookmark the permalink.